i love the colors on this. just amazing! I agree- I love a panna cotta with a gelée; did a post last March about a basil-infused panna cotta and passion fruit gelée I had tried (it was delicous) and just recently had another in a restaurant in Miami- again basil panna cotta but topped with roasted fruit. 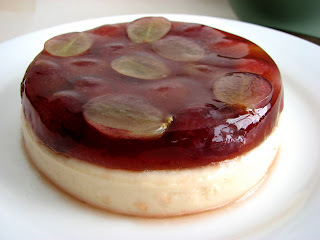 I think your idea of including a fruit IN the gelée makes it more interesting, prettier and tastier. 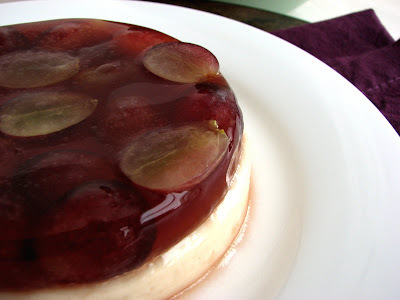 Love the idea of using grapes. as simple as it is to make, panna cotta is definitely one of my favorite desserts to eat. always so fresh and light too. love the tanginess of the yogurt but the richness of the brown sugar. a must try! Though I've never made anything like this (yet) I must say it's lovely and looks refreshing. Speaking of Gourmet, add me to the list of readers who were completely taken by surprise. I think it's sad. It makes me value even more the gigantic 1950 Gourmet cookbook that I have. It's unlike any other cookbook I've ever seen, with astoundingly various recipes, each one explained with a brevity that is quite astonishing. At least there will be a huge body of Gourmet work to refer back to in the future. 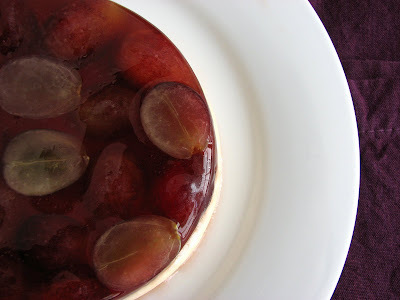 The grapes suspended in the gelee is a beautiful image. 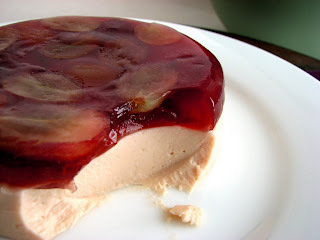 The combination of creamy and gelee is delicious. That's a beautiful looking dessert. Mmm...I've never heard of this, but it looks so delicious! If I give you my address, will you send me some? This just looks very inviting. Would like to have some.